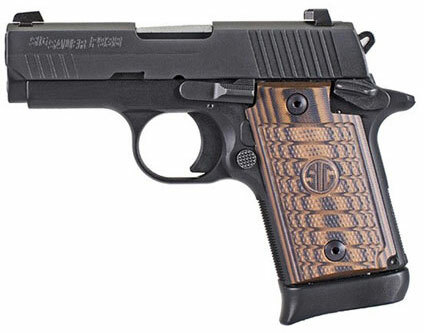 Reacting to many requests from the marketplace for a subcompact SIG SAUER pistol, engineers designed the P938 Select as a smart looking, small handgun built with the same accuracy and reliability as large frame SIG SAUER pistols. With an overall length of just 5.9 inches a height of 3.9 inches, and weighing just under a pound, the P938 Select is the ultimate firepower in an all metal frame concealed pistol. Additionally, the contrast sights or SIGLITE Night Sights are removable and adjustable for windage. The sear and trigger return spring are redesigned to prevent spring over-ride of the ejector during assembly. The P938 Select also comes with custom G10 grips.